If you're running Windows 10 and a regularly applying patches, you may have noticed you have less and less hard drive storage space. Lack of storage space might not be an issue if you're running a desktop with many TBs of space. But for those running laptops, especially the ultrabooks, you may be noticing the shortage. Open 'File Explorer' window (shortcut is Window Key + E). Navigate to 'File' > 'Change folder and search options'. Go to the 'View' tab. In the Advanced Settings section, check the radio box labeled 'Show hidden files, folders, and drives'. Click the 'OK' button to apply the changes. Now the folder is hidden by default for a reason. It's unsafe to blindly delete the files. These files (MSI files) are stored when applications are installed or updated in Windows 10. If you were to simply delete these installers from the folder, there a risk of problems in the future. That being said, a subset of these files are likely orphaned, meaning the application they belong to have already been deleted or are no longer needed. Identifying the orphaned MSI files is the solution to this problem. 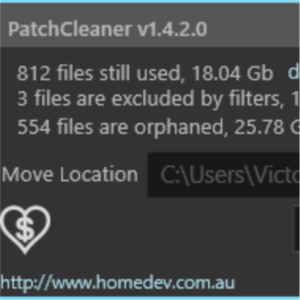 PatchCleaner is free software that scans your system and identifies the MSI installers that are orphans (no longer needed). Those can then either be moved to another drive for safe keeping or deleted. Since its free, most people immediately suspect this might be spyware. But PatchCleaner has gotten rave reviews. For me, I had 30 GB of MSI installer, but PatchCleaner had identified 10GB worth of unnecessary files. Just to be safe, I moved the files to a external thumb drive and put that in a drawer. It's been over a month, at which time I've applied updates and installed new software, and nothing has gone wrong. Give it a year, and I'm more confident that PatchCleaner identified the correct files to remove.